Albert Darvill was born on 30th March 1880. He was the youngest of six children born to William and Rebekkah Darvill. Albert attended Oakley School between 1885 and 1893. 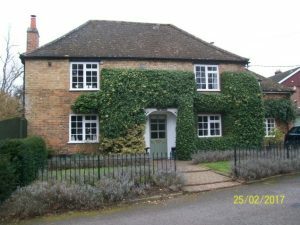 In 1911 the census records that William and Rebekkah, both in their seventies, were living in Little London, Oakley and still had five of their grown up children unmarried and living at home. Albert, aged 31, was shown to be employed as a general farm labourer. In September 1916 Albert George Darvill, aged 36 joined the Army. Private Darvill, Regimental Number 8111 became an enlisted member of the 2nd/5th Bedfordshire Regiment. He was single, 5’ 6” tall and weighed 133lbs. (9.5 stones). He seemed to have a few health problems, including flat feet and his general condition was noted as B2. He also spent two weeks in hospital in April 1917 suffering with influenza and psoriasis. Albert was later transferred to unit 693 Agricultural Company and given a new Regimental Number 484499. His service records are badly damaged in parts so it is hard to determine some of the details they contain. It’s doubtful that Albert travelled very far during his service, exotic names such as Bradford and Worksop feature in his records. There is one small entry which says Service Abroad, India, South Africa but gives no other details. It is more likely his agricultural skills were used on the Home Front providing food for the fighting forces as well as the nation at large. Nothing is known about Albert’s life after he left the Army in March 1919. He died aged 94 on 8th April 1974. Probate records show that he lived at The Nap House at the time of his death. Oakley’s Nap House as it looks today.